Each card features a well-known work of art paired with an insightful quotation. The cards in this unique deck may be used for traditional tarot readings or individually for daily inspiration. Select a card, slide it into the built-in, pop-up frame, then let the images and words work together to encourage contemplation. The 32-page illustrated booklet provides standard tarot meanings and a special Creativity Spread. For over 25 years, Charlene Livingstone taught Art and English to gifted students in Toronto. She is still very involved with the arts and writing, and currently works as a Gallery Guide at the Art Gallery of Ontario. 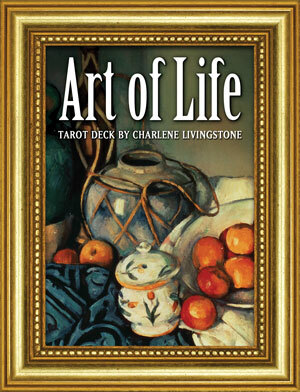 The Art of Life Tarot brings together Charlene's literary interests and her background in visual arts.